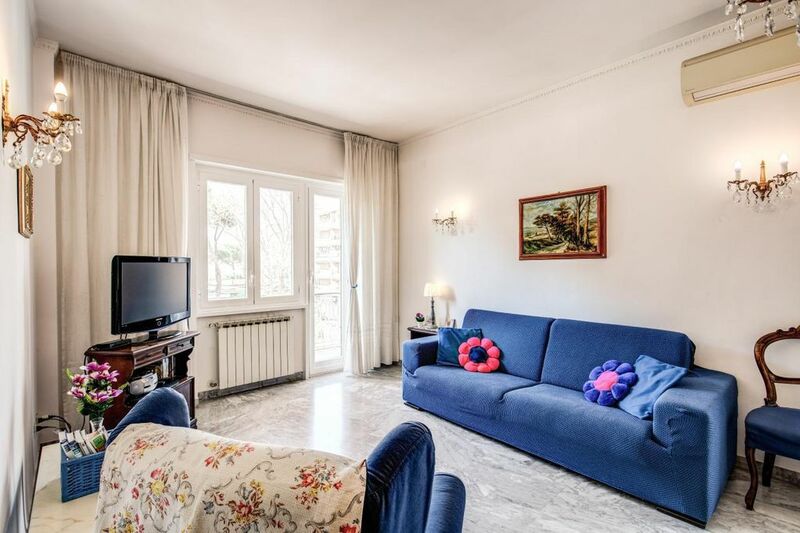 BlueClassicHome is a spacious, elegant and bright apartment tastefully furnished with fine Italian ‘60s furniture, marble floors and large balconies. It is walking distance to St. Peter's Basilica and it is very close to the main tourist spots. It is an excellent starting point to spend unforgettable days in the Eternal City. BlueClassicHome is a spacious apartment 100 mq2 wide (about 1080 sq2), it is located at the second floor according to the road, in a modern brick-face building with elevator. Right in front of the building there is a lovely communal garden, a nice place of recreation for local residents and for children. It can comfortably accommodate up to 6 people. Enjoy your stay in Rome like a Roman; our apartment is completely independent and perfect for everyone who wants to have a home-base to relax and live the City with our special Italian style ! This opportunity is a convenient alternative to the small hotel rooms, a real unique chance to combine money saving with an incomparable location, between typical restaurants and astonishing artistic beauties. The apartment is composed of: a large entrance hall and a long corridor leading to the rooms. Fully equipped kitchen with table and chairs. A master bedroom with a double bed with orthopedic mattress, a large wardrobe, dressing table and a dresser. A second bedroom with a single bed which according to your needs turns into a double bed with orthopedic mattress, a desk with a chair and a large wardrobe. Large living room with a blue double bed sofa with orthopedic quality mattress, a table with 6 chairs. A storage room. A modern bathroom with shower. As a backdrop, all along the whole perimeter of the apartment there are beautiful balconies. Elevator, air conditioning in the large living room, central heating, sheets, blankets and towels, unlimited wi-fi internet access, unlimited Italian phone calls, washing machine, TV with DVD player and its library, oven, microwave, refrigerator and freezer, American and Espresso coffee machine, hairdryer, iron and ironing board, vacuum cleaner. Upon prior request we can provide you a baby cot. Upon request we can arrange private transfers from and to the airports for a very reasonable price. Touristic city tax (EUR 3,50 per day per person) is already INCLUDED in the price shown. The apartment is located OUTSIDE the ZTL area (Limited Traffic Zone) so you can easily park your car in the streets around the apartment for free. The famous "Gregorio VII ° - San Pietro” district where the apartment is located, with its elegant buildings, houses famous Italian furniture stores making it one of the most prestigious areas of the city. Near BlueClassicHome you will find: supermarkets opened 24 hours, the famous local market, banks, pharmacies, distinctive breakfast bars, pizzerias, restaurants and much more. The location is very central and close to many historical sites that can be easily reached on foot. BlueClassicHome is only 5 minutes walk to St. Peter's Basilica and from the famous "Sistine Chapel" and the Vatican City. The apartment is located only few steps away to all the best transport hubs of the City. Line 916 leads to Corso Vittorio, Campo de 'Fiori, Piazza Navona, Pantheon and Piazza Venezia. Lines 881, 98 and 34 leading to the Tiber River, Castel Sant’Angel and Piazza Cavour. Line 64 leads to: Corso Vittorio, Campo de’ Fiori, Piazza Navona, Pantheon, Piazza Venezia, Via Nazionale and Termini Station. In a 5 minutes walk you can reach "San Pietro Station" which is part of the city railway connections. From there you can reach most of the whole city from north to south and the Roman coast in few minutes. With a 10 minutes 982 bus ride you will reach the nearest Metro stop line A called: ”Ottaviano - San Pietro”. Final cleaning: once per object Costs amounting to 25 EUR (Mandatory).